Chautauqua Auditorium in the morning. Photo by Ann Duncan. Golden banner and the Flatirons. Photo by Ann Duncan. ONE OF THE THINGS THAT MAKES TRAVEL SO ALLURING IS ITS ABILITY TO TRANSPORT. You get to leave your daily life behind to step into a new world, even just temporarily. A new place, new faces, new experiences. Even a different time period. At least that’s what it feels like here. 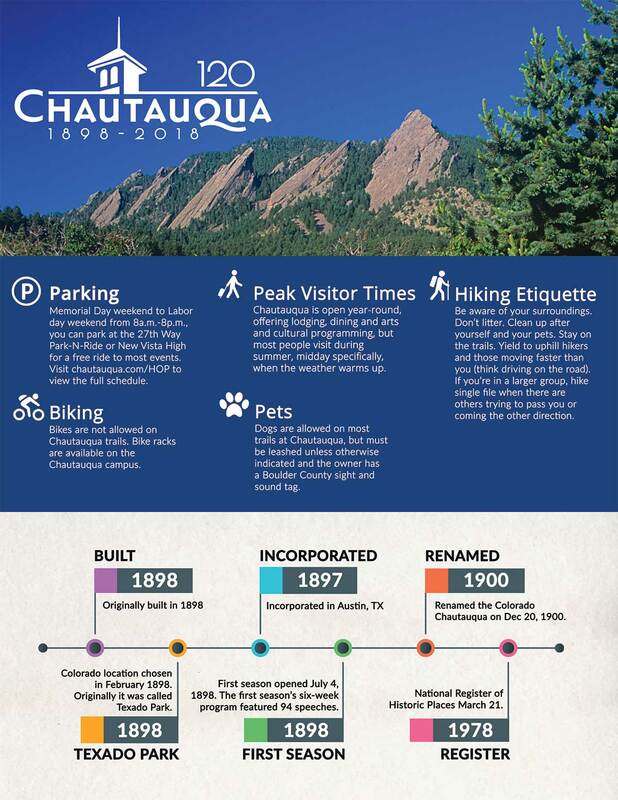 There are many reasons the Chautauqua landmark in Boulder is one of the most popular spots in town, for locals and visitors alike. One of those reasons is its rich and unique history, which is still prominent today. You can see it in the cottages, whose renovations have not sacrificed their historical details. As you sit down for lunch in the dining hall, you feel it all around you; the restaurant was one of the original Chautauqua constructions, dating back to 1898. This place is steeped in history, and that adds a layer of significance and interest to what would already be a memorable experience. In fact, Boulder’s Chautauqua is the only chautauqua west of the Mississippi. It is one of only four chautauquas that have been continuously running since they opened. 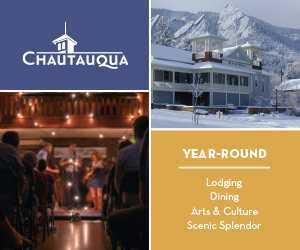 Sign up to get regular info on Chautauqua. At its core, a chautauqua today is entertainment and education, the good, ol’-fashioned way. A chautauqua is all about education and culture. It brings entertainment, art, music, speakers, teachers and more to communities. Chautauquas date back to the late 19th and early 20th centuries. You could find them across rural America. 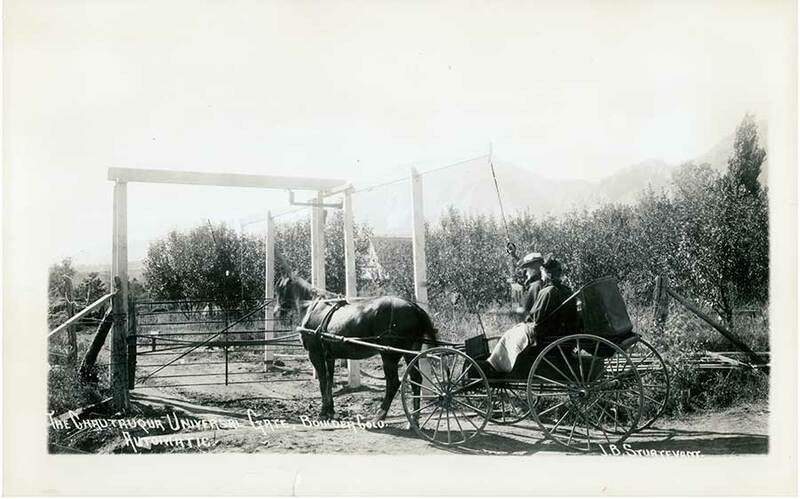 In fact, it was the desire for education and entertainment by rural farmers and ranchers that fueled the movement. But as radio and movies took root, followed by cars that allowed rural residents to travel to the city for entertainment, chautauquas began dwindling. At the height of their popularity, there were hundreds, although most have since closed. Boulder’s, one of the last chautauquas standing, has remained strong throughout the years. Although it launched back in the 1800s, it’s still highly relevant today, bringing in famous bands, world-renowned speakers and artists that rival many of Colorado’s flashiest modern theaters. The cool thing about the Colorado Chautauqua is it goes far beyond just a big stage. It’s like a mini-town within a town, with its own lodging, restaurant, store, hiking trails, activities, gathering places and more. 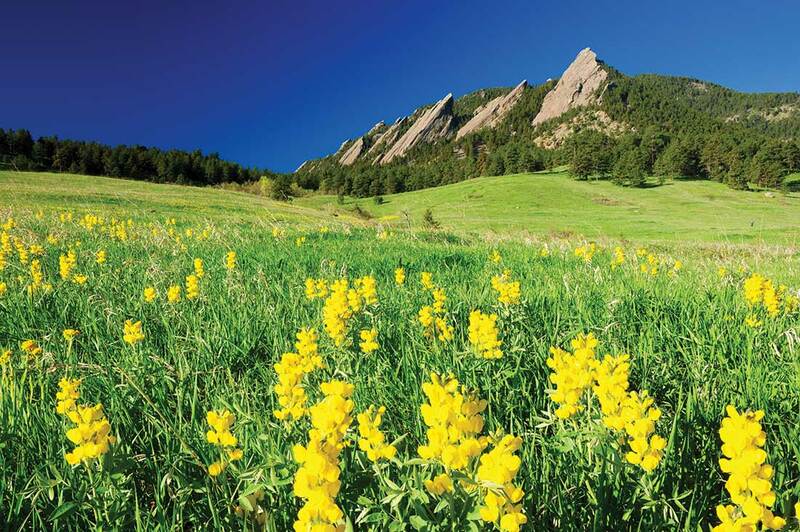 You can plan an entire vacation in Boulder just around Chautauqua Park. The Colorado Chautauqua is a National Historic Landmark — and that’s no status to throw around lightly. It’s not easy to earn this honor. Only some 2,500 locations have been so recognized for their “exceptional value” in history. There are only 25 National Historic Landmarks in the state of Colorado. The Colorado Chautauqua grew out of the desire to start a summer school for Texan teachers in a cool climate. They paired with a chautauqua to make it happen because chautauquas were so popular at the time. The site was chosen for its mountain setting and healthy environment. 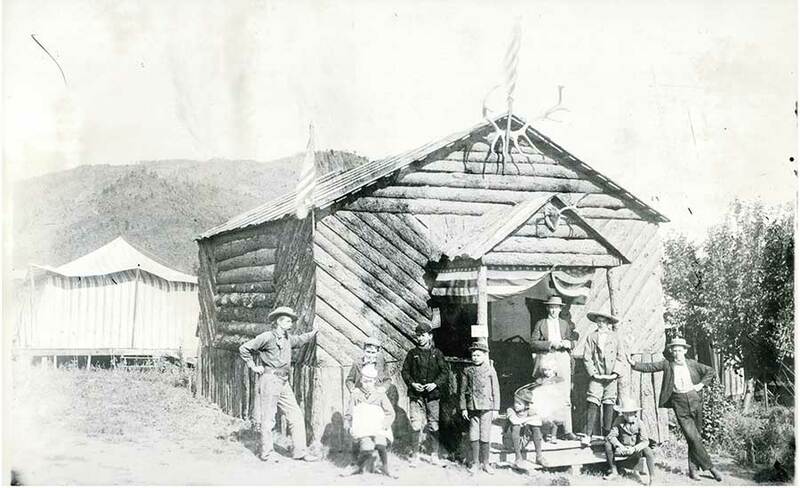 The heart of the Colorado Chautauqua remains the same, as do most of the buildings: The Community House, the Auditorium, and the Dining Hall are still used for their original purposes. But some things have changed over the years. Plus, Chautauqua aims to be America’s greenest National Historic Landmark. Emmy Lou Harris and Rodney Crowell. Photo by Jonathan Auerbach. The Colorado Chautauqua is a bit of a rockstar of an attraction. It has an impressive resume of awards, titles and brushes with fame. Chautauqua garnered its most well-known and impressive honor when it was named a National Historic Landmark in 2006. For context, there are only 25 of these landmarks across the entire state of Colorado, and Chautauqua is one of only two in the Denver-Boulder metro area. The Colorado Chautauqua is one of only a few chautauquas still around in the nation. It’s the only one west of the Mississippi River that’s been in continuous operation since opening. And it still has its original structures intact and regularly in use. It is also the only chautauqua that still runs year-round, and the only one whose grounds are free and open to the public. Over the years, thousands of performers have graced Chautauqua’s stage. Among the famous musicians: BB King, Chris Isaak, Melissa Etheridge, the Indigo Girls, K.D. Lang, John Hiatt, Andrew Bird, cellist Yo-Yo Ma, grandfather of bluegrass Bill Monroe, composer John Philip Sousa, Ralph Stanley, David Byrne, Lyle Lovett and Los Lobos. In addition to famous musicians, other kinds of celebrities have presented and spoken at Chautauqua. On the list: author Stephen King, orator William Jennings Bryan, prohibitionist preacher Rev. Billy Sunday, “gonzo” journalist Hunter S. Thompson, Vice President Al Gore, the Rev. Jesse Jackson and comedians Paula Poundstone and Steven Wright. Five of Chautauqua’s cottages have earned the esteemed Environmental Protection Agency’s five-star energy rating for efficiency and comfort. 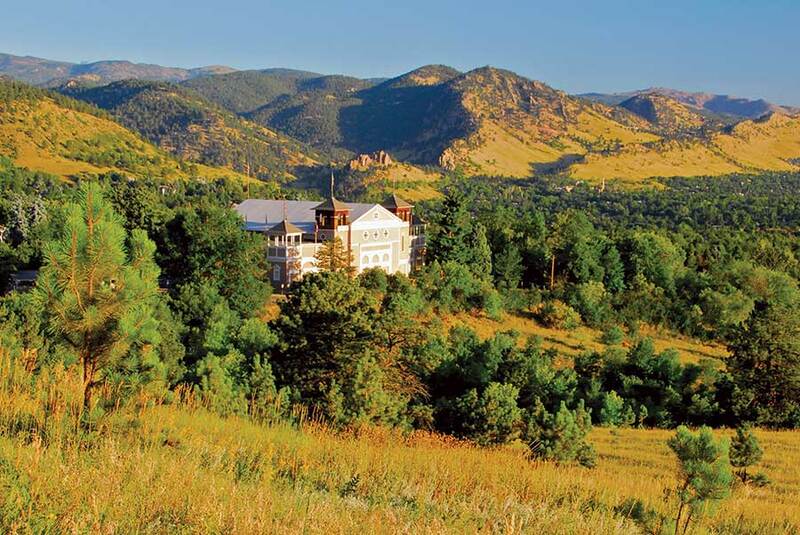 The Colorado Hotel and Lodging Association awarded Chautauqua the Green Hospitality Award for its sustainability initiatives in the hotel industry. It won the third-place award several years ago, after it began improving energy efficiency in the cottages and lodges, installing water-conserving plumbing and efficient lighting and more. This is a particularly rare achievement for historic hotels and buildings. Runner on Bear Peak Trail. Photo by Ann Duncan. THE TRAILS HERE ARE ALWAYS RATED AMONG THE TOP HIKES IN TOWN. The scenery. Oh, the scenery. These views are the quintessential Boulder postcard shot. No matter your level of activity, spending time outside in Chautauqua Park is a must-do in Colorado. The park spans 14 acres — including Flagstaff Mountain, Green Mountain, the Royal Arch and Bear Mountain — just off Baseline Road at the edge of the foothills. It’s a public park and free to use, although on warmer days, it can be pretty packed and tough to find parking. Luckily, between Memorial and Labor Day weekends, you can hop on the bus for a ride to the park (the steep trek up Baseline from downtown may be too tough for many bikers). Here’s a look at some of the many ways you can enjoy Chautauqua’s outdoor playground, from easy picnic hikes into the trees to challenging climbs up the Flatirons. 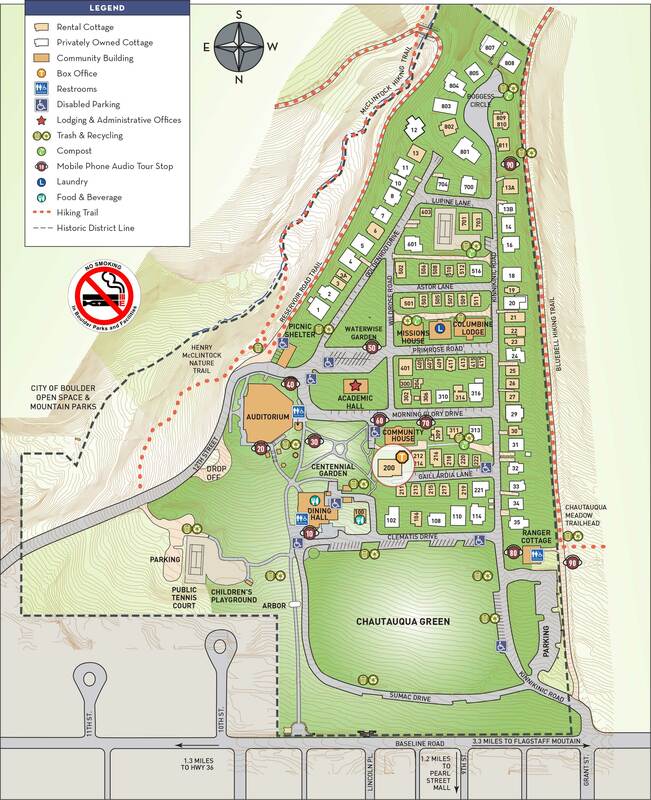 Before you set off to hike the trails around Chautauqua, make sure you stop at the Ranger Cottage, where you can get a map and the most updated information on the weather and trail conditions, as well as wildlife activity. They can also tell you about events and activities for the day, such as live Meadow Music, concerts, speakers, painting classes and guided hikes. 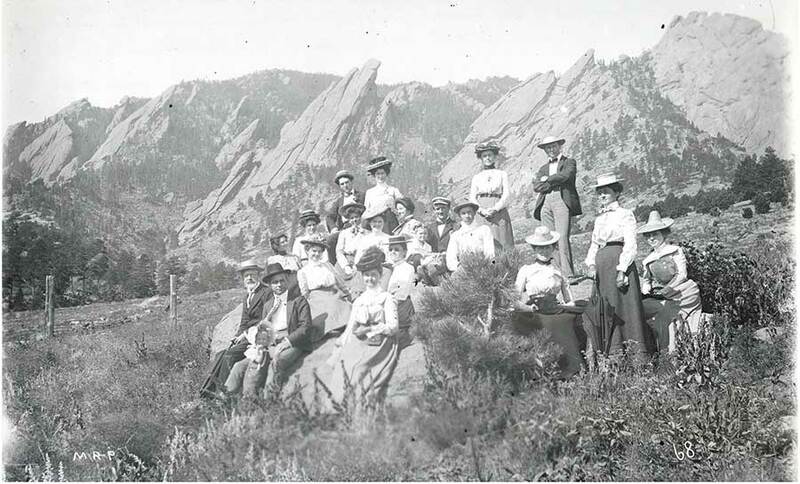 You can set up a donation-based, private tour led by Chautauqua staff or join Boulder Walking Tours for a historic tour. These tours are easy and cover less than a mile of ground in about an hour and 15 minutes. After visiting the Welcome Center, stop by the Chautauqua Dining Hall or General Store to grab a bite to eat to fuel your adventures. It’s important to stay hydrated in the Boulder mountains, even if you’re planning an easy hike. The altitude and intense sun can be hard on your body. Explore trails individually or link them together for all kinds of different loops. Hiking here can be a choose-your-own-adventure experience. A self-guided history hike: If you want an educational experience, go on the self-guided Cultural Resources History Hike along the Chautauqua Historic Loop. The moderate to easy hike will take you from the Chautauqua Ranger Cottage along a 3.5-mile loop. This is one of the park’s most popular hikes, so it can get pretty busy. Enchanted Mesa Trail: This is an easy to moderate hike, but it’s short, at about two miles long. The Enchanted Mesa Trail starts on the south side of the Chautauqua Auditorium and features a gentle climb to an overlook with great views of the region. Along the way, look for the historic stone bridge, which miraculously survived the big flood in 2013. The bridge will bring you to Mesa Trail, if you want to continue on. Mesa Trail: Continue on to the Mesa Trail if you want a longer hike: nearly seven miles, in fact. But it’s pretty flat. This meandering path connects with tons of other trails along the way and branches off in various directions. It’s long, but it’s also fun because there are so many different ways to piece it together. Woods Quarry: This unique trail spins off the Mesa Trail and takes you up about 0.3 miles to an abandoned rock quarry. It’s a unique stop along the way or a destination for some great photos. In true Boulder style, many people also work out in Chautauqua Park. Plan your workout on your own or join a class, like the Fitness For Living Boot Camps and PowerFit Yoga Camps, held at Chautauqua in warmer weather. The boot camps are four-week-long, small-group fitness classes. The yoga classes combine yoga and conditioning in the park. You can try the first class for free. Yoga in Your Park also offers outdoor classes in different locations across Boulder, including Chautauqua Park. The enormously popular Flatirons offer rock climbing for all levels and styles, from bouldering to multi-pitch technical routes. You can take the First Flatiron Trail (1,500-foot elevation gain in just about a mile) to bring you to the First and Second Flatirons. There’s also the Third Flatiron Climbing Access Trail. But be smart, have proper gear and for goodness’ sake, don’t try to make it alone and without ropes. A safe and smart way to climb the Flatirons is through the Colorado Mountain School, which offers various guided, group climbs on the First or Third Flatiron. The first Flatiron route is rated moderately difficult, at 5.6. The Third Flatiron is a classic rock climbing route, rated a 5.4 and great for beginners. but bikes are not allowed on the trails. Chautauqua Dining Hall. Photo by Ann Duncan. 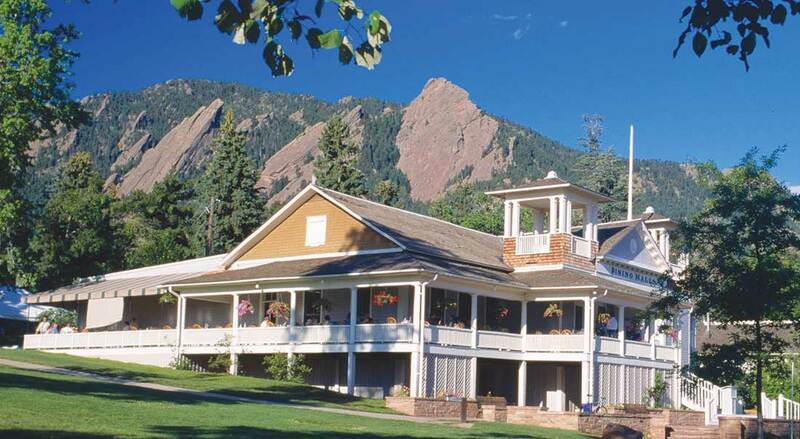 The Chautauqua Dining Hall is one of the best places to eat in Boulder. Boulder is a town for foodies. In fact, Bon Appetit named Boulder the Foodiest Town in North America. It can be hard to choose between the many award-winning restaurants and menus made by celebrity chefs. But a visit to Boulder won’t be complete unless you leave the beaten paths downtown for a trek to the foothills, where you’ll find the Chautauqua Dining Hall. The best way to experience this restaurant is after a hike on the nearby trails or after a concert in the auditorium. Don’t be fooled by the casual name or its affiliation with the park. This isn’t your ordinary cafeteria slop or overpriced frozen dishes microwaved upon order. This restaurant offers high-quality, fresh, Colorado-inspired fare, catered by Three Leaf Concepts. Family-owned Three Leaf operates some of the area’s top award-winning restaurants, including the famous Boulder Dushanbe Teahouse and the Huckleberry in Louisville. The food is enough reason to sit down at the dining hall, but while you’re indulging, request a table on the stunning wrap-around porch with views of the Flatirons. The building is one of the original Chautauqua constructions, opened in 1898, and it has been preserved to carefully retain all of its historical charm. You can see echoes of the past throughout the building, such as how the bar is made out of repurposed train car flooring. This year, in celebration of Chautauqua’s 120th anniversary, the restaurant features monthly anniversary-inspired menus. For example, one menu celebrated the years 1910-1920, when Boulder saw an influx of Italian immigrants coming to work in the railroad and mining industries. What that translated to on the special menu: bison meatballs and the Aviation cocktail, made with gin, maraschino liqueur, creme de violette and lemon juice. During the off-season (October through May), look for a great happy hour list called Mid-Day Specials from 3-6 p.m.
Late November through April, the Chautauqua Dining Hall also offers a traditional afternoon tea service with tea from the Dushanbe Tea House. Add sparkling champagne if you want. It’s served with a three-tiered assortment of fresh-baked sweets and pastries. When the weather outside is chilly, cozy up next to the fireplace with your teapot. The dining hall runs a number of family-friendly and children-inspired tea events, too. These typically sell out, so plan in advance. Always keep an eye out for special events, such as a Mother’s Day brunch. IN BOULDER, HEAD TO THE HILLS FOR SOME OF THE STATE’S BEST ENTERTAINMENT. cultural programming, dining and lodging year-round. July Fourth this year isn’t just Independence Day. It’s also Chautauqua’s 120th anniversary. 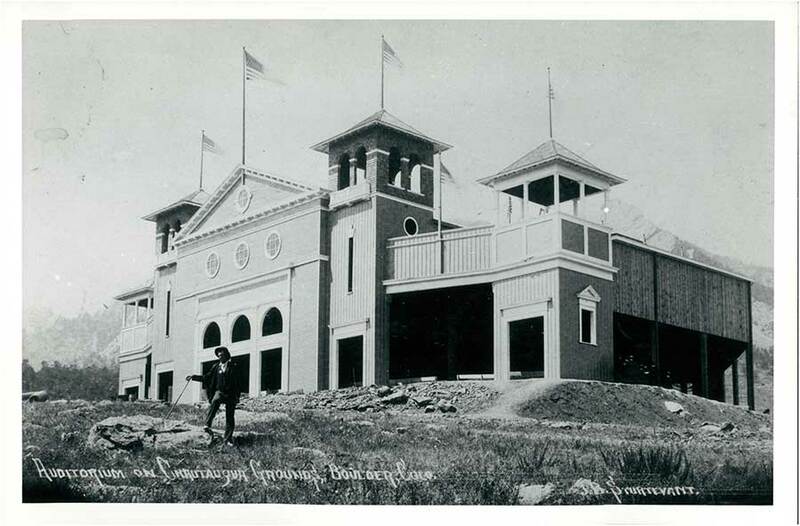 Boulder’s Chautauqua opened July 4, 1898. While the trails around Chautauqua are closed on the Fourth of July after the sun goes down (to prevent people from setting off fireworks in the forest), the grounds are open in the morning — and there are plans to help you kick off the holiday right. The Boulder Concert Band will perform music, including Americana, patriotic tunes, Independence Day traditionals and classic concert band tunes on the Chautauqua Green. The performance is free, open to the public and runs 11 a.m.-1 p.m.
Don’t try to drive your car and park at Chautauqua for this big event. Instead, take the bus, rent an electric bike, hike, carpool or call and Uber or Lyft. There’s a drop-off lane for this purpose. chautauqua.com/portfolio/boulder-concert-band-on-the-green. Here, you can find performance details, dining options and contact info for free history tours. 7 p.m. May 21: This show pairs musicians and dancers in unexpected combos to celebrate creativity, talent and diversity. Picture breakdancers with ballerinas, a harpist with a high-school drumline, a Native American flutist with a slam poet. 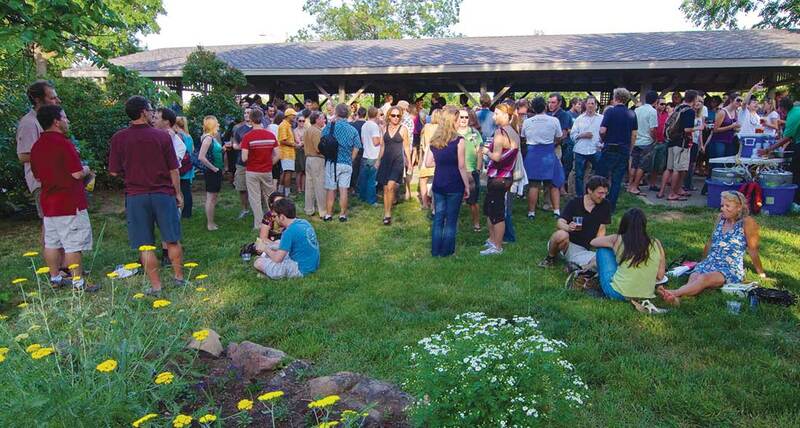 Murmuration is a Boulder-based organization that’s fun, family-friendly and always popular. Tickets are $20. Step back in time and watch famous silent films accompanied by live music. See classics featuring the likes of Charlie Chaplin, Buster Keaton and Harold Lloyd. In this year’s lineup: “Rin Tin Tin,” “The Mark of Zorro,” “A Charlie Chaplin Comedy Night,” “Dr. Jekyll and Mr. Hyde” and “Beggars of Life.” The last is a newly restored and refurbished film about a train-hopping hobo. The film features a new score written by the Mont Alto Motion Picture Orchestra. For each film, live music is performed by musicians who specialize in playing live alongside silent films, just like in the ’20s. Another highlighted film is the “Epic of Everest,” a documentary from 1924 following two climbers who recorded their attempt on Mount Everest with a hand-cranked camera. Not only is this some of the earliest film footage of the life of the inhabitants of Tibet, but the two climbers never made it home. The film did, however, which makes this documentary even more special. The full list of performances is available at chautauqua.com/upcoming-events. This is an annual, six-week summer concert series that features the Colorado Music Festival Orchestra. The festival draws internationally respected musicians and has been recognized by the National Endowment for the Arts for its high caliber performances. The festival opens on June 28 with violinist Vadim Gluzman. The Chautauqua Auditorium isn’t the only place for entertainment. The Community House hosts events from September through May, including concerts, documentary films, speakers, the Space Series, the Explorer Series (featuring famous explorers) and an author series. The Community House is an intimate venue with a capacity of 125. This year, it celebrates its centennial anniversary. 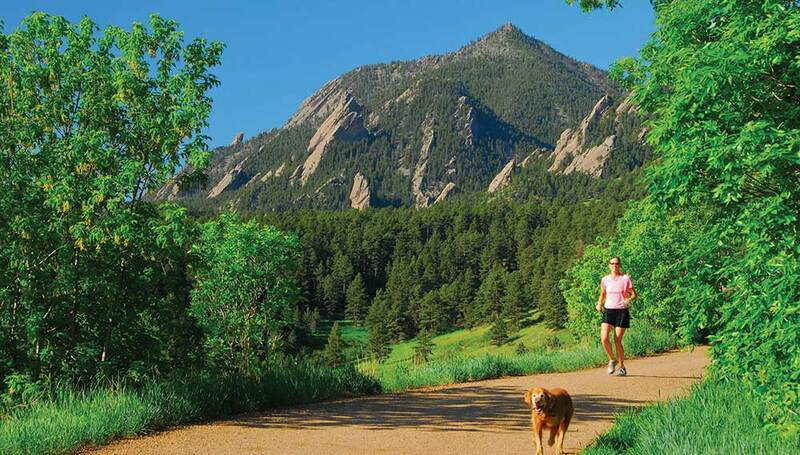 SOME OF THE BEST HIKING IN THE COUNTRY IS RIGHT HERE, RIGHT OUT YOUR DOOR AT THE COLORADO CHAUTAUQUA. You might not be able to have your cake and eat it, too. But you can stay in the mountains and in the city, too, when you book a cottage at the Colorado Chautauqua in Boulder. This collection of historic cottages is easily the most interesting and most scenic place to stay in Boulder. Depending on where you stay, you can get direct views of the Flatirons from your bed or porch, and some of Boulder’s most popular hiking trails may start directly out your back door. At the same time, the Pearl Street Mall and University of Colorado campus are just minutes away. Even if you think you know the Chautauqua cottages, look again. Twenty-three cottages are scheduled to undergo upgrades in 2018. The renovations will carefully balance preserving the historic integrity of the buildings with providing modern comforts, fun decorations and eco-friendly updates. The Chautauqua is a historic landmark, so it never “remodels” its buildings. But it has made some changes to meet the needs of the modern guest. In the first few months of 2018, Chautauqua updated 12 of its 62 cottages, with plans to complete 11 more by the end of the year. The specific updates depend on what each cottage needs, but you may see energy-efficient appliances, updated paint jobs, new tile and gas fireplaces to make the cottages more cozy in colder months. The cottages range from about 285 square feet for a studio efficiency unit to about 980 square feet for a three-bedroom. Cottage rates range from $95 for a studio to $312 per night in the summer for a three-bedroom house. In addition to the cottages, there is the Columbine Lodge. This is more hotel-style, with rooms in a large shared building, rather than stand-alone cottages. These rooms are less expensive. Summer prices range from $95 per night for a single to $180 per night for two joined one-bedroom units. All cottages and units in the lodge have a full kitchen or kitchenette, fully stocked with pots, pans, plates, silverware and more. This makes Chautauqua ideal for longer-term stays. Pets are welcome in all lodging except the Missions House and Columbine Lodge. Chautauqua lodging is full of local influences. Cottages are equipped with locally and sustainably made Verlo mattresses, Boulder-roasted Ozo coffee and tea from the Boulder Tea Company. In addition, rooms feature high-quality amenities, such as mahogany hangers in closets. What lodging doesn’t have: TVs or phones. That’s intentional. Wifi is included in the stay but it’s not intended to be high-speed for watching movies. It’s for quick check-ins online, if needed. “We’re really bringing in some fresh life,” says Shannon Bock, marketing manager for Chautauqua. The goal of the updates: a blend of the past that’s relevant to the present, says Wanona Tara, hospitality manager. They replaced outdated wooden chairs with new, metal chairs for a modern-rustic feel. In some cottages, staff has made stairways safer, opened up the kitchen areas, replaced plastic bathtubs with ones made of subway tile, traded classic rugs for vinyl rugs and made the rooms more pet-friendly so they’re easier to clean. “We’re creating wow factors,” Tara says. For example, they swapped out standard refrigerators for retro Big Chill refrigerators in different colors and shapes. In place of a yellow “toast” paint, walls were painted different colors and cuts and accents. Not all of the 62 cottages need to be updated, says Tara. Cottage 6, for example, has a lot of historic character and personality; it was updated with new couches a few years ago, but otherwise left as was, Tara says. “As a design concept, it’s lovely and shows off the character of Chautauqua,” she says. The 100-year-old Community House will also be updated in 2018, with wood floors on the garden level in the Rocky Mountain Climber’s Club. In order to appeal to a broader audience, Chautauqua removed animal trophies, painted the walls a crisp white and upgraded lighting to create soft, well-illuminated meeting spaces. Each cottage is different. Here are some inside tips on where to stay, depending on what you’re looking for. Trail access out your back door and Flatirons views, stay in a cottage along the perimeter on the west side. These cost about $20 more per night, due to the demand and location. They have immediate access to the Bluebell Trail. Trail access outside your porch without Flatirons views, stay in a cottage on the perimeter on the east side. These lead straight to the eastern trails, such as the McClintock Trail. Newly updated space with a rustic-modern character and colorful walls, stay in one of the cabins in the 500 or 200 row. The best cottage: “We are attempting to make all of them as amazing as the others, in their own right,” Tara says. 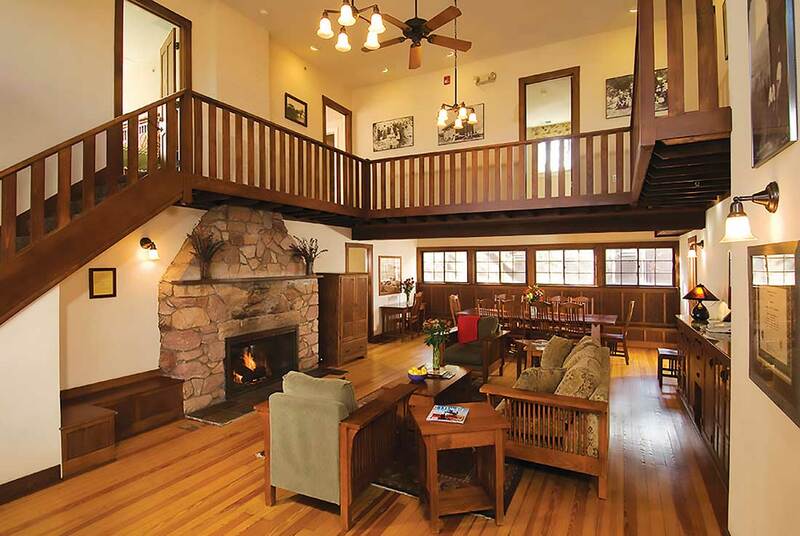 A lower price point (no pets allowed): The Columbine Lodge offers 15 units. Built in the 1900s, the lodge has received some recent furniture upgrades, with more planned for the future. The best views: “The campus is relatively compact. Any time you go outside, you’ll see a view of the Flatirons,” Tara says. But if you want to see them from your backyard, book a cottage on the west side. Do you ever host Road Scholar events?